NOTE: The Scan module does not vectorize these types of digital drawings and you cannot view them in Control Center. If you do decide to use these drawings, you must follow the standard procedure for scanning drawings for a regular scene (with the Control Center and Harmony modules). 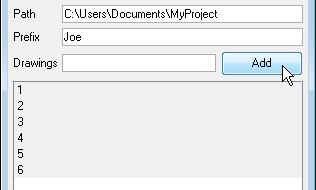 NOTE: The prefix and a dash automatically appear in front of the drawing names you add when the Harmony creates the files of the scanned drawings. 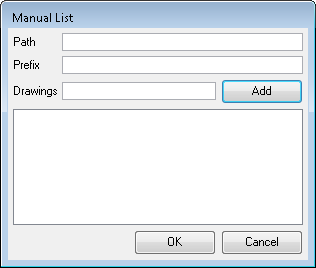 NOTE: To modify the manual entries in the Drawing List, you must reopen the Manual List dialog box and go through the process of building the manual entries again.